Wheres everyone Going this weekend?? Heading with my dad to Siebert Lake on Saturday and likely Elinor Lake for Sunday....likely will fit in two hours tonight at Floating Stone Lake. Last edited by Kyle; 06-15-2007 at 05:16 PM. I'll be going to Lake Suncor for a six day trip..
well good luck to you all, where ever you are going. Make sure to take pics and share reports. Heading out to Turtle lake for a week, 1st time , hope the fishing is good. No fishin' for me this Father's day weekend either. My sister-in-law decided it was time for all the in-law side to come "warm" her new house this weekend. The "in-laws' as you may have guessed ain't fishing kind of folks. I have been a dad for 22 years now and rarely get to go fishing on what may very well be the best fishing weekend of the whole year here in Alberta cuz of things like ball tournaments, track meets, races, etc and "non-fishing" family events like weddings and now "house warmings'!!!!!! It's always been a pet peeve of mine that no one seems to think anymore that there might be dads out there that really would like to go fishing on Father's Day!!! Some of my best childhood memories are the fishing trips my dad (God rest his soul) and I took on this very weekend!!!!! Good luck and tight lines to all you Dads!!! !,,,,,, and "kids" taking thier dads fishing!!! Clearwater river in the morning , range time in the afternoon! Caught and released a 26" and a 27.5" walleye Thursday morning before work, just about 1 mile upstream from the horse pasture. Two smaller ones under 16" as well. used unbaited 1/4oz. jigs with chartruese tails. Good luck and tight lines to all you Dads!!! !,,,,,, and "kids" taking their dads fishing!!! 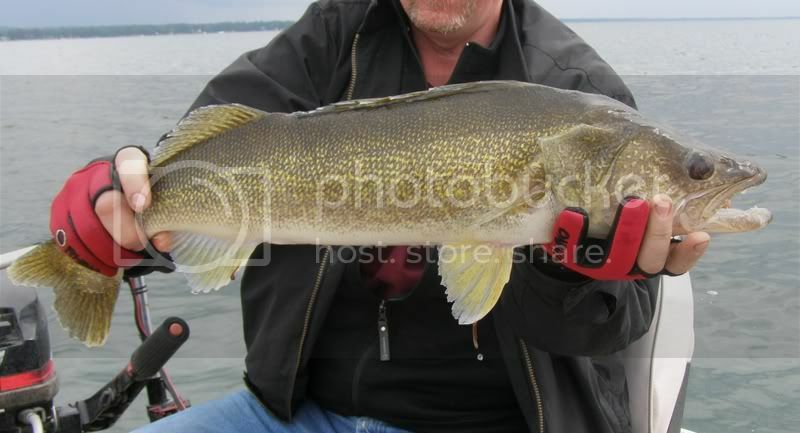 Nice walleye you got there whatcha nail him on? a 7mm will drop anything LIVING THE DREAM!!! I get to goto work and play with guns and bows all day!! nice, i was cranking a few Raps yesterday, in about 12 -14 but no takers. Nice fish for sure, you have one of those tags for pigeon? Caught many pike this weekend in limited time from shore. Fished the Raymond Reservoir mainly, good times despite the wind. Here is a picture of one pike I caught, has a nasty sore on it's side. Anyone know the cause? Yes we have class A tags, i clipped a tag on that one and my Son put a tag on a chunky 54.